Trying to reformulate or develop new products with healthier ingredients and cleaner labels can be a complex process. It often involves removing or replacing highly functional ingredients with specific purposes. Here are some emerging ingredients that can give formulators more ways to simplify labels and meet demands for nutrition, function and taste. Choline is macronutrient that aids liver function, normal brain development, eye health and vision, nerve function and muscle movement and supports energy levels for a healthy metabolism, according to the Institutes of Medicine (IM). Along with its impact on the brain throughout life, choline helps prevent neural tube defects in fetal development. It was always considered an important nutrient by dietary professionals but was really thrust to the forefront when the 2015 Dietary Guidelines Advisory Committee listed it as a critical but under-consumed ingredient. Choline-rich foods include eggs, liver, beef, chicken, fish, broccoli and toasted wheat germ. It's also available in supplement form, including pre-natal vitamins. Currently, more than 90 percent of the U.S. population doesn't meet the IM recommendation for choline, the institutes note. As a result, choline is also being incorporated into the new Nutrition Facts label. "With the choline recommended daily intake (RDI) as part of the Nutrition Label revisions, we’re beginning to see more and more callouts on both front and back labels [of packages]," observes Thomas Druke, director of strategic marketing, human nutrition and pharma at Balchem Corp. (www.balchem.com), which makes VitaCholine supplement products. 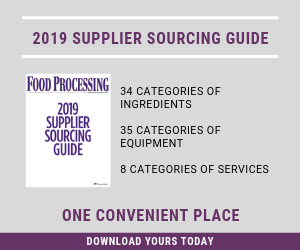 "Regulatory/industry changes are driving early innovators of food sources high in choline and will drive more awareness and spur fortifications." Acerola, a cherry-like fruit rich in vitamin C and native to Mexico, South America and Central America, has been prized for thousands of years for its medicinal properties. Now widely exported globally, acerola fruit contains rich amounts of antioxidants, vitamin A, thiamine, riboflavin and niacin. Acerola is claimed to help manage diabetes, reduce signs of aging and allergic reactions, prevent certain types of cancer and improve heart health. In culinary applications, it has a distinct flavor and can be eaten raw like regular cherries (although they aren’t related) and added to baked goods, candies, ice creams, jellies, jams and frozen juice concentrates. It's been poised or predicted to make a mainstream run for a handful of years, and data from Mintel Group (www.mintel.com) indicates it's making a dent. New product launches containing acerola cherry rose by 36 percent between 2012 and 2016, the market research firm reports. Naturex's (www.naturex.com) portfolio of sustainably sourced, traceable acerola products called AceroLife provide shelf life extension and are packed with organic acids. Suitable for meat and poultry applications, they act as "natural" preservatives and are available in organic and conventional varieties. Acerola Cherry 17 offers oxygen-scavenging properties that protect meat pigments against oxidation, which improves color. Sourced in Brazil when their vitamin content is at its highest level, acerola made into powder has been shown to have 26 times more antioxidant activity than orange. Acerola can substitute for ascorbic acid in powdered mixes for bakery with no loss in performance, the company states, and the colors and pectins can liven the look of products while adding texture. Another antioxidant-rich fruit − coffee fruit − the pulp surrounding the coffee bean, is considered more potent than superfruits such as acai berries. New-age beverage company Bai (www.drinkbai.com), which was recently acquired by Dr Pepper Snapple Group, helped put coffee fruit in many American minds, making it one of the company's most used antioxidant ingredients. CoffeeFruitPure (www.coffeefruit.com) uses coffee fruit pulp sourced from the Kona Coast in Hawaii, previously discarded in traditional coffee production. It's available as a liquid, fine powder or tea cut for applications in food, energy beverages, shakes, teas, alcoholic drinks and dietary supplements. It can be used in functional products as a healthy-aging antioxidant and in supplements, says Stuart Nixon, business development director at CoffeeFruit Pure. Additive-free, CoffeeFruitPure contains phenolics and chlorogenic acid, which help fight free radical cell damage. In addition, for every 6 million tons of coffee consumed, there is roughly 24 million tons of waste produced, addressing the impact of discarded fruit pulp waste, Nixon says. Kernza, a perennial wild cousin of wheatgrass with a sweet and nutty taste, is getting a big boost from food giant General Mills. It will be interesting to see if any other companies pick up the new/old grain. Kernza has the typical nutrients associated with wholesome grain crops, but its main attraction is the environmental benefit. It's a drought-resistant crop with long (10 ft.) roots that doesn't need to be replanted every year. In committing to the crop earlier this year, General Mills said kernza shows promise in benefitting soil health, carbon sequestration, water retention and wildlife habitats. Cascadian Farm, owned by General Mills, agreed to buy an initial amount of kernza to eventually commercialize it. General Mills hopes to have kernza-based products in the market some time in 2018, notes Jerry Lynch, General Mills' chief sustainability officer. Curcumin is a fat-soluble substance in turmeric that helps reduce inflammation. Naturex highlighted both curcumin and acerola at Supply Side West in September for their functional food abilities − curcumin/turmeric as a digestive health ingredient. Several studies suggest curcumin might ease symptoms of osteoarthritis and rheumatoid arthritis, such as pain and inflammation. It's also believed to have antioxidant and perhaps even cancer-fighting properties. In lab tests, curcumin seems to block the growth of certain kinds of tumors. One study showed that turmeric extract containing curcumin could, in some cases, stabilize colorectal cancer "not helped by other treatments." But more research is needed. Turmeric and curcumin are showing up in retail applications from teas (Numi Organic) and smoothies to curry powders, roasted and frozen vegetables, soups, dressings, rice dishes (Healthee Organic Turmeric Brown Rice), sparkling water (Arya) and of course, a longtime familiar favorite, "yellow" mustard. Naturex also offers turmeric for its natural coloring properties. "Curcumin extract is ideal for adding a yellow color to a huge range of culinary applications, varying the intensity as required," says the company, which will soon make an organic version available. In early 2015, Kraft committed to removing synthetic ingredients from its products – even before the merger with Heinz. Yellow 5 and 6 in Kraft's iconic Original Macaroni & Cheese Boxed Dinner were replaced with turmeric, along with annatto and paprika, because they're derived from natural sources. And no consumers complained. With its use becoming legal in parts of the country, marijuana has been in the news … followed closely by the benefits of some of its components. We've done a few stories on the market for "edibles," now some highly refined marijuana ingredients are jockeying for a role in mainstream food products. Cannabidiol (CBD), a cannabis derivative compound, is said to possess significant medicinal benefits, but doesn't make people feel “stoned.” Research shows marijuana therapy has analgesic, anti-inflammatory and anti-anxiety properties without the psychoactive effects of tetrahydrocannabinol (THC), the compound in cannabis responsible for a euphoric high. Patients with chronic conditions such as cancer and epilepsy have used medical cannabis oil extracted from high-CBD varieties of cannabis with varying degrees of success. Isodiol (www.isodiol.com), a "phytoceutical" company that develops non-GMO cannabis derivatives and extracts, says its hemp oil, anhydrous hemp oil, sprays, patches, serums and bulk products are third-party lab-tested and certified food-grade. One of Isodiol's goals is to fight misinformation concerning CBD. Recent health claims suggest beet roots can help lower blood pressure, fight cardiovascular disease and prevent dementia. They're a good source of iron and folate and contain nitrates, a key amino acid called betaine, as well as magnesium and other antioxidants (notably betacyanin). Beets are becoming a popular superfood and an ingredient and on their own, as athletes prize them for improving stamina and boosting workouts. They're also a good source of copper, dietary fiber, vitamin C, iron and vitamin B6. Beet root is available in powder form from such providers as Nutraceutical Corp. (www.nutraceutical.com), which makes an organic beet version under the Sunny Green brand. Nutraceutical Corp. also offers Dynamic Health organic beet juice and ready-to-drink beet root juice. Dehydrated and ground, the beet powder can be used in gravies, sauces and to provide color in recipes. "Online searches for beet juice and beet root have escalated over the past five years. It’s a clean-label ingredient that helps increase athletic performance without use of stimulants and with cardiovascular benefits," says Max Willis, marketing vice president at Nutraceutical Corp. "Once people discovered the cardiovascular benefits beets are reputed to provide, this root quickly went from [being] the 'messy-to-prepare tuber' used in potato salads to a superfood. Beets are believed to help boost stamina by increasing nitric oxide production and help [people] exercise longer, due to greater oxygenation of the muscles through improved blood flow." While most adults don't need more arginine, this "conditionally essential" amino acid is critical for preterm infants and others with certain medical conditions, who are unable to synthesize or create arginine internally. It's key to the biosynthesis of protein and plays an important role in cell division, the healing of wounds, removing ammonia from the body, immune function, and the release of hormones. Almost all dietary protein contains arginine (except gelatin). It's found in meat, fish, fowl, eggs, dairy, grains, beans, corn, nuts, vegetables and leafy greens. Korean fermentation business and consumer food producer Daesang Corp. (www.daesangamerica.com) hopes arginine is more than conditionally essential. It makes arginine via fermentation technologies. A component of collagen, and found in red meat and shrimp, arginine helps the body produce nitric oxide, which relaxes blood vessels. It's a key intermediate in liver and (to a lesser extent) kidney function. Resistant starch, which helps dieters feel full but escapes digestion in the small intestine, has been making inroads for a decade or so. Instead of the usual grain sources, unripe bananas have been found to have high levels of RS, according to International Agriculture Group (www.iagnubana.com). Designed for clean-label products, its NuBana green banana flour performs as a functional fruit texturizer. Inherently high in starch, it's also high in potassium and magnesium. Produced when the starch content is at its highest, NuBana is rich in amylopectin. The free-flowing powder has a neutral aroma and a bland taste with no banana flavor, as the sugar and banana flavor haven't yet developed, explains Rhonda Witwer, vice president of marketing and business development (she was the evangelist for resistant starch a decade ago at National Starch). Launched at the Supply Side West show, NuBana N200 contains 65 percent resistant starch, which Witwer says is the highest in the market, which also gives it superior binding and adhesive capabilities. The non-GMO flours contain probiotic fiber and can help replace sugar by replacing bulk. "Resistant starch has been on the radar of the health recommender community for over a decade because of the quality science conducted on its health benefits in a variety of applications," she says. "When the FDA approved a qualified health claim stating RS2 resistant starch may reduce the risk of diabetes, interest really shot up. You can add less and have room for other things in a formulation." "The flour is a great fit for stabilization and clean-label viscosity modification," notes CEO Maurice Moragne. While more plant-based proteins are being adapted to better-for-you-foods, some taste bitter. Four-year-old food tech developer MycoTechnology Inc. (mycotechcorp.com) has created a fermentation process using shiitake mushrooms' root systems, whichi results in a flavorless bitter blocker called PureTaste. "We de-flavored the product so it would be easy to formulate with," explains marketing manager Josh Hahn. The vegan protein is non-GMO, sustainable and rich in Lentinan 1-3 1-6 beta-glucans that regulate the immune system. The company also uses the technology in a mycellation process for a stevia product called ClearTaste, designed to smooth out stevia's bitterness and simultaneously removing added sugars using the mushroom's mycellium or vegetative components.